No wardrobe is complete without a pair of white denim, don’t you agree? I recently picked up this pair of AG “Prima” jeans at Nordstrom and have been wearing them non-stop. Have you ever worn AG jeans before? This was my first pair and I’m totally obsessed. They don’t lose their stretch wear after wear and are a high-rise fit (the best kind). I also adore the big pockets that sit low on your bum. I often get bored with the drab winter colors of black, gray and navy, so replacing my black or blue jeans with a white pair in any outfit is just what I need to update my look. I’ve never been one to follow the Labor Day rule of wearing white and think the idea is a bit outdated. It’s a style staple I tend to wear year-round because it always looks so chic! I’m also dying to own this zipper-adorned pair by Paige Denim. If you’re looking for white jeans under $100, this pair by KUT from the Kloth is pretty stellar. Whatever you plan to wear with them, or whenever you plan to wear them, you must invest in a good pair of white jeans. Click here to shop all of the best white denim at Nordstrom! Love the second outfit the most, it is so sharp and love the pop of green and turquoise. I completely agree. White jeans are a staple piece all-year round. Love both style so much. I must look into AG jeans, they look great on you. This probably sounds horrible, but I don’t own a pair of white jeans! I always say I’m going to get a pair, but I always back out of it because I think they look funny on me! However, I think you’ve totally convinced me to get a pair after this post! Two great outfits! That green Alexander Wang, amazing! I have been wearing a lot of winter white but I cannot wait to lighten it up with a blouse like you have in the last look. both looks are perfect! 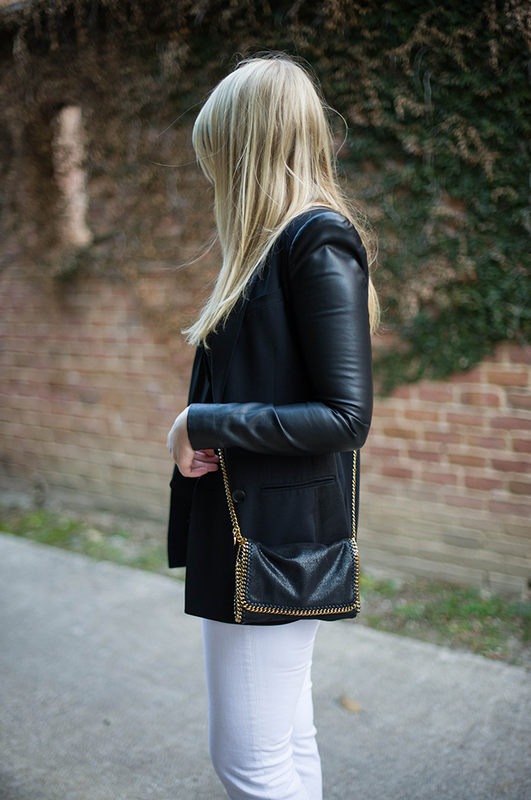 I’m always drawn to white denim styled for colder temps. Your green bag is stunning and so luxurious looking. Your style is always spot on, girl! Love these white jeans, I’ve actually never owned white jeans or AG jeans! Definitely planning on getting a pair this Spring! I’ve heard such good things about AG Jeans. Definitely have to check them out! Love how you transitioned this pair from winter to spring! Love this post! I am craving all things white for spring! Great post! The green bag in the later post and the blazer in the now post are great! I totally agree that white pants don’t have to wait until after Labor Day. Love both of these looks! That green bag is the best! I love those Fendi booties and they pair perfectly with your white jeans. The first look is my favorite but both are great. So chic. Especially love the first look! I love both of these looks, and I agree white jeans can be worn year round! 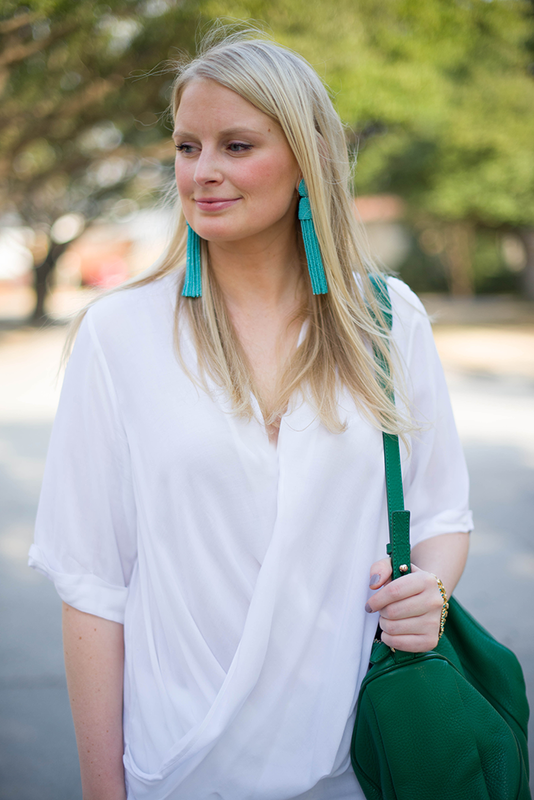 I’m also obsessed with those teal earrings! absolutely love both looks & i’m a sucker for a leather jacket, but the all white with a pop of green reallys adds a little somethin’ somethin’! Loving both looks, but the black and white has to be my favorite – its the best combo ever! Nothing better than clean, white jeans! 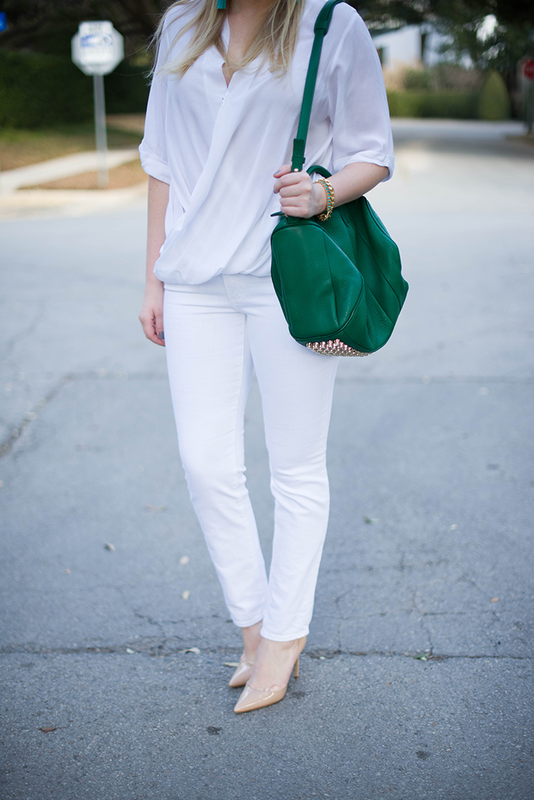 I’ve been in search of white jeans…so this post came at the perfect time. Love the black blazer too. ohhhhh myyyy gooodnesss and I thought I “needed” the pastel wang no no now it’s all about the green! Also get ready spring Stella clutches are to die! I LOVE white all year round. The only reason I haven’t worn it in a while is because Kansas has gotten so much snow that I basically would blend in with the ground. 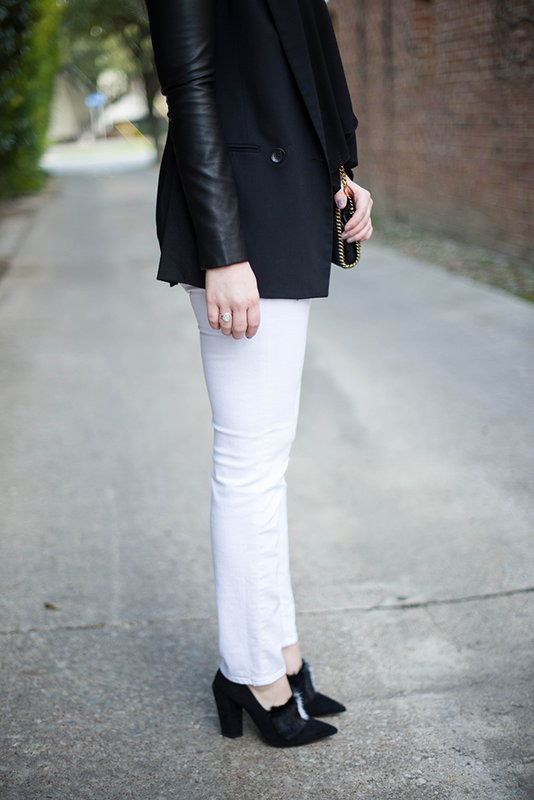 A classic black and white outfit is always in season as you masterfully showed us here! 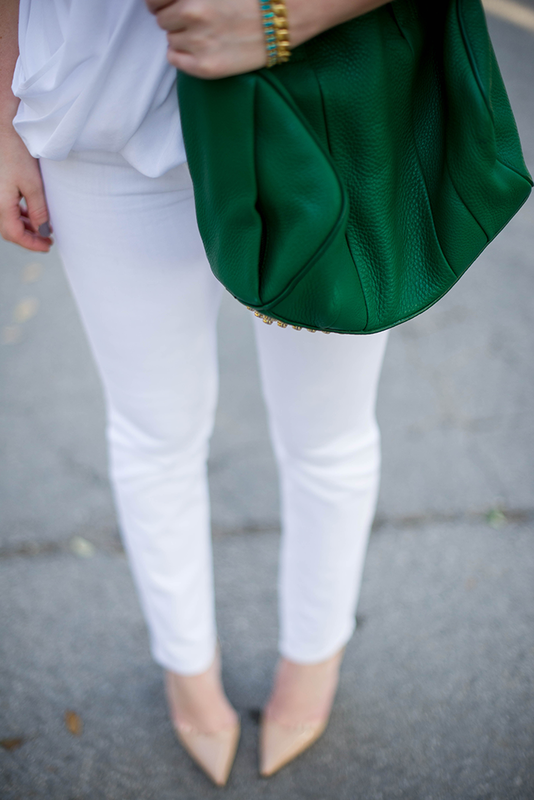 White jeans are definitely a wardrobe staple. Both looks are fabulous on you! I love both ways, especially the later one. Great color combinations with the earrings and bag. I also adore the jacket on your first look. I bought my first pair of AG jeans about a month ago and I’m in love too! The white ones your wearing are gorgeous and I love how you have ideas to wear it now and later. Love the pops of green. So pretty! Love them both! The green bag and earring on number 2 – so amazing! Such gorgeous looks! I wish I could pull off white denim a bit better…I’ve yet to find a good fit for my curves. Looks great on you, though!!!! Both looks are so gorgeous but lovingggg the all white with the pop of green- so fresh and beautiful; too bad I’d never be able to keep that clean haha! Love both! Big fans of white jeans all year. You look fantastic in them! I need everything in your closet. Adore those jeans and that BCBG blazer. Great post! I really love those Fendi Shoes, what are they called? I can’t find them anywhere! Absolutely stunning- love this post!